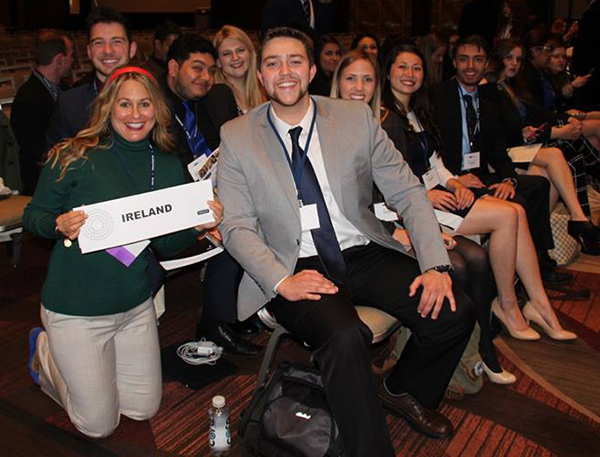 Amid the competition and international perspectives of students from around the world, Sonoma State University's Model United Nations delegation earned its 11th and 12th awards in the past six years at the National Model U.N. Conference in New York City last week. I was proud to be a student in the group that took home awards for Outstanding Delegate and Honorable Mention Delegation. Before I joined, the concept of Model United Nations was foreign to me. I understood there was some type of international government organization, I just didn't know what that meant exactly. Model U.N. gave me perspective on the United Nations as well as the world and the issues it faces. It also helped me understand how things get done--or don't get done--in terms of international governance. The conference includes a competition aspect where students from universities around the world represent one of 193 nations and are assigned to a committee in the U.N. Within that committee, teams are given a topic and debate from the stance of the nation they're representing. The teams are judged on how they represent their nation and debate their stance. In the months preparing for the Model United Nations Conference, our group of 22 Sonoma State students went through rigorous hours of preparation. We gave improvised speeches, wrote detailed arguments on our stance on issues and learned the etiquette of the U.N. The conference was long and demanding, though through the hard work and countless hours of dedication, our delegation became a team, each person playing a role and succeeding as part of a cohesive group. The concept of 22 students working together for the first time and travelling to New York City seemed a bit intimidating when I first joined the class. But as the semester progressed, I soon realized we were more than just a team¬. We were all friends. Through the hard work of being a part of Sonoma State's Model U.N. program, we all saw each other grow as individuals--something I see as one of the greatest benefits of the program. Model U.N. teaches students so much more than simply what the United Nations does and how the world cooperates--it teaches young people how to collaborate and communicate with people of different backgrounds, and how to speak confidently in a public setting. Throughout the semester of preparation, each of us developed confidence in our public speaking skills and learned to put faith in the skills of each other to achieve success. The program offers students the opportunity to develop real-world skills, ones that often can't be developed in a classroom. Model United Nations was one of the best decisions of my college career, not simply because of the conference itself, but because of the intangible skills and experiences I gained during the weeklong trip. Model United Nations is a political science course offered at Sonoma State University every spring semester and is open to students of all majors. The National Model U.N. Conference is held in New York City each year, drawing more than 4,000 students from universities around the world.